Car manufacturer Hyundai was behind a complaint about Nico Rosberg's proposed German grand prix helmet livery. That is the claim of Germany's Auto Motor und Sport, on the day the German driver was reportedly instructed to change his celebratory helmet because it included an image of the famous world cup trophy. 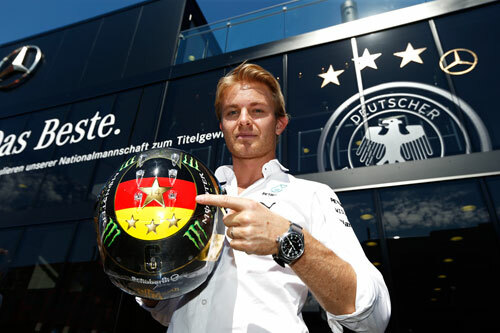 World football federation FIFA contacted the Rosberg camp to inform him his proposed helmet was an "unauthorised reproduction of its intellectual property". Rosberg told his Twitter followers the news is a "shame, but of course I respect the legal situation". He has replaced the trophy image with a simple star, and told reporters at Hockenheim that the fuss left him surprised. "The world cup as a trademark -- these are the kind of things you have to think of. It's amazing," said the Mercedes driver. "I've replaced it now with a big star and no one can take that away. The star is ours!" A FIFA spokesman confirmed Thursday's news, but Auto Motor und Sport reports that there was another complainant behind the story -- Hyundai. Rosberg drives for Mercedes, but affiliation between the world cup and a car manufacturer is promised exclusively to Hyundai, the official sponsor. Indeed, Mercedes made clear its delight with Germany's world cup win on Thursday with a huge message on its F1 motor home, reading "Das Beste" and congratulating the national football team on its "Title win". But no mention was made of the world cup itself, or its protected marks.